Coach Hatchett became head of the boys basketball program this year. 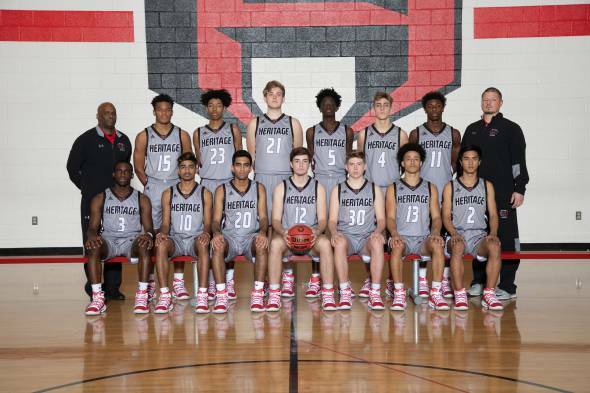 Michael Jordan once said, “Some people want it to happen, some wish it would happen, others make it happen.” The Heritage High School athletic department has comprised a group of young athletes that “make it happen” with the help of the new varsity boys basketball coaches, Coach Hatchett and Coach Sellars. As expected, with the arrival of any new authority figures, there are many changes affecting different aspects of the sport. These changes could be things such as coaching style, new workouts, building character in athletes, conformity, and overall teamwork. After speaking to Coach Hatchett, it gave insight into his mentality as a coach and role model. The transition into becoming the team’s coach was not easy for Hatchett. When he first started coaching the team, the athletes were used to running practices and games a certain way. “It was challenging to change their mindset from doing things the old way to my way,” Hatchett says. Hatchett values building character in his athletes, so the players did many team-building events outside of school, such as going to elementary schools to help kids and being more active in the community. Besides Hatchett, the players on the team also have their opinions on the new changes. Moustapha Sene, senior, said, “I like Coach Hatchett’s new coaching style because practices are harder, so it makes the games easier. We’re also more of a family than a team.” In agreement to that statement, Max Jannes, sophomore, loves the new coaches and changes that they brought in. Jannes believes that the changes are beneficial to the team, as they now play at a faster pace. In contrast, Loic Ndjomgoue, junior, says, “I think the new coaching style quickly adapted to a few players, but others are still getting used to it.” However, all the athletes agree that the team feels more like a family. The basketball team’s changes and improvements are leading to what can be a positive future for the already great program.